Newly updated, this popular reference manual on noninfectious complications addresses clinical presentation, morbidity, differential diagnosis, mechanism of action, treatment and prevention for each type of reaction. Click above for more detail. Far outweighing the diligently cornered, known infectious risks of transfusion, noninfectious risks garner significant attention at the forefront of efforts to advance patient safety. Adverse events such as transfusion-related acute lung injury (TRALI), graft-vs-host disease, hemolytic or allergic reactions, bacterial contamination and many others are the subjects in the spotlight for Transfusion Reactions. Newly updated, this reference manual on noninfectious complications is as prominent in the field as it is comprehensive. Appropriate for clinicians, lab technicians, and nurses worldwide, the content is accessible for either subtopic or in-depth review. 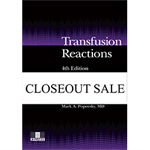 In addition to the chapters on specific types of reactions, the contents address nursing and cellular therapy perspectives, conditions in the developing world and prevention strategies. As in previous editions, authors address each complication in terms of clinical presentation, morbidity, differential diagnosis, mechanism of action, treatment and prevention. The role of patient blood management. Chapters on TRALI and transfusion-associated circulatory overload (TACO) reflect recent improved understanding of these complications since the third edition. Every chapter has been meticulously updated with the latest research and perspectives; some have been expanded.